Blueberries: The flavor of these delicious Northblue blueberries seriously outshines that of the frozen blueberries we've been eating. Toss these in with your granola, sprinkle on pancakes, garnish ice cream, or just eat them straight up. See notes at left for some more information about the source of these berries, Little Hill Berry Farm in Northfield. Zucchini/summer sqaush: These are featured in this week's recipe. We were heavier on zucchini than yellow squash this week, so some of you may receive just green zucchini. Green top red and gold beets: Gold beets are a little sweeter than red beets, and have less of the earthy flavor often associated with red beets. Together, they make a beautiful color combination. The greens can be sauteed like you would Swiss chard. Broccoli: The last couple of days, we've been making a really simple broccoli stirfry: start by sauteeing onions or garlic (scapes) if you have them, then add the broccoli and some tamari, mirin cooking wine, and a bit of sesame oil. Cook until crisp-tender. Scallions: These are used as a garnish in this week's recipe, and pair well in most most dishes containing jalapeños. Could also be nice atop a cucumber salad. Jalapeño peppers: These early jalapeño peppers are not as spicy as more mature peppers will be, but still pack some heat. Most of the heat is in the pith/membrane, so scraping out seeds an pitch will greatly dimish the spiciness. Just be sure to wash your hands with soap right after chopping these! Use in this week's recipe. Cucumbers: We're in the height of cucumber season. We enjoy eating them in cold salads, such as this simple, Japanese-inspired cucumber salad. English cucumbers: Thin-skinned and seedless, these crispy cukes have great flavor and are one of our best sellers a market. Swiss chard: This week, full shares are receiving green chard and half shares are getting red chard. This Chard with Orange and Bacon recipe would be a fun one to try. The recipe may need to be scaled down a bit based on the quantity of chard in your box. Head lettuce: Full shares are getting red leaf and half shares green leaf lettuce this week. We got a heavy downpour last Thursday, so some soil likely splashed into these lettuce heads. While we did wash them before packing into CSA shares, you'll want to rinse the leaves after you pull apart the head before eating. I'm super excited to share this box with you all, because, for the first time, we're partnering with a fellow farm nearby to provide you an item we don't grow, ourselves: BLUEBERRIES! Blueberries happen to be our favorite fruit, and you better believe we brought in a little extra. Gotta give them a thorough quality evaluation before sharing them with CSA members :) They are delicious, I will tell you. Things on our farm have been swell. It was a hot week last week, puncuating a prolonged period of dry conditions. But that was remedied with a nice, heavy rain (about 2 inches) on Thursday evening, which watered in newly planted crops and gave a much needed drink to established crops. I can't tell you what a relief it was to actually get a solid rain after seeing several prior storms miss us. One of the plantings we got in late Wednesday evening was a native grass buffer that borders the adjacent non- organic field managed by a neighbor. This is a mix of several native prairie grasses, many of which will grow quite tall when mature (5-6' ft). 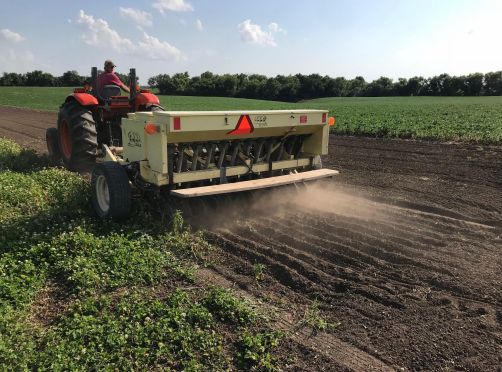 We intentionally excluded any flowing forb species, because we don't want to attract any pollinators to this area where they could be exposed to neonicotinoids or other insecticides used in corn and soybean production. But we do want a tall, perennial vegetative buffer to serve as a spray drift barrier. The function of nurse crop is to quickly germinate and form a canopy to compete with weeds. Meanwhile, the native grass seeds will germinate and get established below the canopy of the oats. In about two months, the oats will start to flower, at which point we will mow off the oat. Since oats are an annual crop, they won't re-grow. In theory, with the oats gone, the native grasses will then take off. The next big project on the horizon in the vegetable realm is harvesting garlic and onions, followed by the curing (drying) process needed to allow them to be stored long term. Typically, garlic is harvested 3-4 weeks before onions are, but this year is a little different. Because we had snow on the ground for almost a month longer than usual (through most of April), the garlic ‒ which is planted in the fall ‒ came up much later than usual. Meanwhile, the onions were planted about on schedule and have enjoyed a favorable and warmer-the-average growing season up to this point. I'll admit that this is comfort food. But with zucchini or summer squash comprising the bulk of it, I think you can feel ok about it :) We made this recipe with three jalapenos with all the seeds and pith scraped out, and I would call it Minnesota medium in terms of heat. 1. Preheat oven to 400°F. Coat a 9-by-13-inch baking dish with oil. 2. Combine squash, onion, jalapenos, salt and ¾ cup cheese in a large bowl. Sprinkle with flour; toss to coat. Spread the mixture in the prepared baking dish and cover with foil. 3. Bake the casserole until it is bubbling and the squash is tender, 35 to 45 minutes. Take of out oven and remove foil. Sprinkle black beans across surface and incorporate with a spatula. Spoon salsa over the casserole and sprinkle with the remaining 1½ cups cheese. Bake, uncovered, until golden and heated through, 20 to 30 minutes. Sprinkle with scallions.